Children and Books | Reflections on children, literature, libraries, and life…and cats. It’s been quite the year since I last posted, which is my only excuse for not posting since June of 2017. Attendance at our programs hit an all-time high in FY’18: an astounding 8,509 for all children’s and teen programs (and of that, 518 was teen attendance and 7,991 was attendance at children’s programs). I say astounding because I work in a town with a population of approximately 6,000 people; for us to have attendance just over 8,500 in a town that small is pretty amazing. I added several regularly occurring programs in the past year, including afterschool movies in the story room, regular afterschool craft programs, and the sensory playtime. Afterschool movies are a terrific low-key program, possible now that we have a projector in the story room. Often the once-monthly family movie night upstairs in Volunteers Hall can be a little intimidating for younger children or children with sensory issues, so it is wonderful to offer an alternative in a smaller room that is inside the children’s room. It is easy for kids to go in and out of the room during the movie, so if anything feels too overwhelming, it’s easy for attendees to take a break. And, of course, it’s a great afternoon activity for kids who are in the library after school. My deepest thanks to the teen volunteers who provide the supervision during the afterschool movies! And the afterschool craft programs are also heavily dependent on teen volunteers. Sometimes the teen volunteers run the craft completely on their own, and sometimes I do the teaching of the craft and the volunteers are my assistants. Either way, we are able to provide a great range of fun artsy programs throughout the school year. But my favorite newer program is the Sensory Playtime. It has taken a lot of work to set up the systems for sensory playtime: I distinctly remember sitting on the floor of the story room sweating bullets as I tried to assemble the water table twenty minutes before the start of the first playtime, and my great relief as my two awesome teen volunteers (both seniors) breezed in, saw my panic, and said to me, “Don’t worry, we’re here now!” Since that first rather terrifying day, the set-up process has been streamlined, and I have gradually added to the assortment of sensory activities. We now offer, on a rotating basis, Moon Sand, Dyed Rice Noodles, Rice Tubs, Colored Salt, Wash the Dinosaurs, the water table, Cold Prints, playdough, Dirt & Worms, and too many other activities for me to list here. So, what is new in programming for FY’19, you ask? Truthfully, there isn’t much room left in my calendar to add new things – we have something scheduled for every single afternoon – but I have managed to squeeze in a program that I am calling “GraviTrax Challenge.” I was really intrigued by the new Ravensburger marble raceway system (find more information here), and I am hoping that I can make it into a cool program for ages eight and up. I’m limiting enrollment to six kids, and I’m going to have them work as a team to build a marble raceway that will get the marble from the start all the way to the finish. I love that there is a building app available from Ravensburger, and I’m excited that we are going to have a children’s room iPad so that kids can use the app to help create their raceway. If the September program goes well, then I will purchase another GraviTrax set, and for the October program we will have two teams of three kids each working on a design. Fingers crossed that this goes as well as I think it will, because it seems like an awesomely fun way to work with physics and engineering. That’s a quick update on the new programming that I’ve added in the last year and will be adding this year. Obviously, there are lots and lots of ongoing programs like book groups and storytimes that also deserve attention, but since they’re not new to my library, I haven’t mentioned them here. And stay tuned for updates on collection development, what’s new in those ongoing programs, and, of course, daily library life! I have always wanted a dog – always. Given a choice, I would have gone with a career of veterinarian, because animals are, and always have been, my first and best love. But given my rampant allergies (an allergist recently told me that I’m “allergic to everything”), and given that I have no talent in math or science (which made my physicist father sad), being a veterinarian was never an option. So when I was about ten I talked to my mother about my desire to have a dog. My mother replied that if I kept my room clean for a year, then I would have shown the necessary responsibility to have a dog. Being the tidiest member of my immediate family at the time (my mother, my father, and me, since my siblings were grown up and away at college), it was an easy thing for me to keep my room clean for a year. I thought it was a done deal, that I had earned my dream dog, a rough-coat collie just like Lassie, but my mother failed me on a technicality. I don’t remember what the technicality was, but clearly I had surprised her in my desire to have a dog – clearly she didn’t expect me to have met the criteria and kept to my clean behavior for a year. Long story short, I didn’t get a dog, and I consoled myself with time spent with our outdoor/indoor cat Tabby, a sweet but grumpy girl who refused to be picked up and who would only snuggle with me when I was wearing my mother’s pale blue fake fur bathrobe. Fast forward to this year. It’s been a rough couple of years, and I’ve been fantasizing about better days. 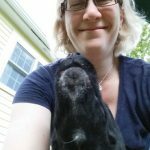 When my beloved feral project Mommy Cat perished in the cold spell of February of this year, most likely after having been shot by a BB gun, I started to allow myself to think about getting a dog. Mommy Cat would have never stood for a dog in her yard, and I would never have brought a dog into our lives as long as she was alive. But after I grieved her miserable and untimely passing I allowed myself to start thinking about what our lives would be like with a dog. I surfed various dog adoption websites. I talked to my dear father, who at this point was suffering from dementia, about the dogs I had applied for. I showed Dad photos of the dogs, and talked to him about his childhood dog, Tuffy. And after Dad’s death in April, I got really serious about getting a dog. I put in adoption applications for ten or so dogs, always missing out because I hesitated too long in applying and someone else who was quicker got the dog. I knew exactly what kind of dog I wanted, and what kind of dog would work for our home: three to four years old, mellow, a dog that had lived with cats, and a dog who was good with children. My perfect dog would be trainable to be a reading therapy dog, and would snuggle happily with our three kitties at night. And then I applied for a dog from a different adoption agency than the one I had been working with. 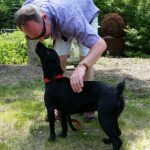 The first agency collects adoption applications from many applicants, giving priority to first applications and then to applicants who best suit the dog. I had missed out on many dogs due to my response time, but had been told that we had a “lovely home.” So with this different agency (recommended to me by my dentist), when I saw Layla, I applied almost immediately. First I sent them an email asking if Layla was good with cats, and when the response was, “Yes! Layla has been cat-tested and done great!”, I applied. 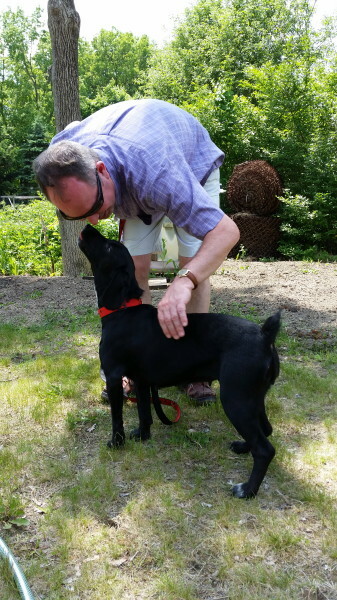 In no way do I fault this adoption agency – they are very good people doing very good things for very needy dogs – but after meeting “Layla” Jim and I learned that they hadn’t met the real dog. Clearly they had been in the so-called “honeymoon period” with this dog, and she hadn’t shown them her true personality. Now named Clara by us, our sweet crazy pooch could best be described this way: sweet, gentle with kids, crazy, just over a year old (i.e., still a teenager), bonkers, spazzy, completely untrained, has a really high prey drive, and is a Lab/Hound mix with a very very big voice (when she uses it). She’s good with other dogs, but extremely excitable. When she sees anything that looks like prey (including our cats), she barks in her loud hound voice and goes after it with all guns blazing. She’s not mature – did I mention that she’s actually a teenager? – and can drive you nuts with her enthusiasm. By some miracle she passed the Basic Obedience Course we took with her; the course instructor said she was “very surprised,” as were we. But that night of good obedience was clearly a fluke, and our dear sweet Clara has shown time and again that she needs A Lot More Training. 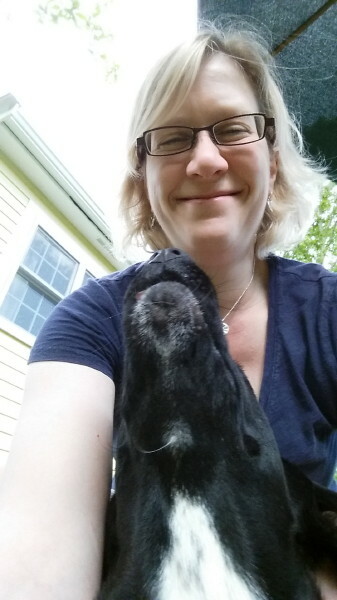 And here is our problem: we have fallen in love with this crazy dog, and despite a recent email to the adoption agency detailing our worries about Clara and the cats, we are hard-pressed to give up on our silly Clara Kerfuffle. But our three wonderful cats are terrified by Clara. Our cats, Moses, Millie, and Moxie, are feral-background cats who were born to feral Mommy Cat in our yard, and who we personally trapped and tamed (in the case of Moxie, against all odds). Our vet has told us that these cats can never live with other humans, that their feral background precludes them from accepting other two-legs. And these same cats have shown great signs of stress from being in the house with Crazy Clara, including a UTI for Moses and all three cats eating half what they normally do. I can’t blame them: Clara barks at them, chases them, and corners them when given the opportunity. Clara has a very high prey drive, and our scared kitties provide excellent potential prey for her, not housemates. If only they would stand up to her and give her a good scratchy swipe on her nose, then perhaps the dynamic would shift. But they’re not built that way, and they run in terror from the Great Black and White Loud Barking Thing with Really Big Teeth. Currently, we live a life divided. Our small house, only 1,000 square feet, has a Cat Side and a Dog Side. We can either spend time with Clara, or we can spend time with the cats. When we are with Clara, the cats give us sad eyes through the French door. When we are with the cats, Clara has to go into That Stinking Crate because otherwise she will chew and destroy everything in her reach. What are we to do? Clara has brought a lot of great things into our lives. As a childless couple, Clara provides us with a great intro to people we don’t know. She’s cute, she’s charming, everyone loves her and wants to meet her. She’s a dog in a million, truly, and we are very blessed to know her. But we’re also very blessed by our sweet, loving kitties. And it doesn’t seem fair that we’ve brought such stress and strain into their otherwise charmed lives. Life without our kitties is unimaginable. Life without Clara is a very sad thought indeed. Perhaps our dilemma is insignificant to some, but I take it very seriously. Four vulnerable lives are affected here, four lives of four beings who can’t speak for themselves. I wish I knew what the right answer was to our dilemma. And I sometimes (often?) wish that my selfish desire for a dog hadn’t put us into this position of having to choose one breed of animal over another. Does tracking your reading time take away the joy of reading? Can the action of having to record the minutes you spend reading make a reader become a non-reader? I’ve often thought about this, and I was very interested to read this article in The Atlantic. The article suggests that the school practice of asking children to read for twenty minutes a night and then to record that time and write about their reading can and does affect how children view reading; that reading goes from being a pleasure to being a chore. My question is, does the summer reading program at the library fall into the same category? The summer reading program is voluntary, so that makes me feel better. But I also know that I participate in the summer reading program each year myself, with the goal of reading at least thirty hours each summer, and that I actually hate having to keep track of how much time I spend reading. I read because I love to read, not because I need to read thirty minutes a day (or whatever time is necessary to get to thirty hours), and tracking feels wrong. Do I count the ten minutes in the bathroom reading The New Yorker? Yuck – but I guess I do. If I get totally sucked into a great story, do I have to look at the clock at the start of my reading and then again at the end and then do the math to figure out how much time I’ve read, rather than bask in the glow of having finished an excellent book? If I’m tracking my summer reading, then yes, I do. So I see why the argument could be made that the library summer reading program could be detrimental to the joy of reading for some children. BUT – and this is a big BUT – we all know that children leave school in June with a certain skill level for reading, and that if they don’t read over the summer their reading skill will have dimished by the fall. This does happen, and the way to avoid that slippage is to read over the summer. Summer is also an amazing time for children and reading, since they have lots of free time and the ability to choose to read whatever they would like. I have seen many children go from functional to avid (and hopefully lifelong) readers over the course of the summer. It can be magic, and the summer reading program helps that magic to happen. In the past ten summers of the summer reading program, there has been little to no cheating as children log their summer reading hours. There’s been no reason to cheat, since pride of achievement has been the main feature of summer reading, and also since children can only earn a maximum of eleven prizes over the summer (three yellow prizes, four blue prizes, and four red prizes). Occasionally a child will come up to the desk on the second day of summer reading with twenty-four hours of reading time logged, only to have the harsh realization that the fibbing in their reading log hasn’t gained them anything – they won’t earn any additional junky plastic prizes from that point on. There has been no point in cheating, and any temptation to cheat has been replaced by a real desire to achieve a personal reading goal over the summer, and to take real pride in that accomplishment. So I was really surprised to have kids ask me about cheating in this year’s class visits. I meet with each elementary school class individually over the course of two weeks, which is important because the cheating question has come up in almost every single class this year (but has never been raised to me in past years’ class visits). The difference this year? The online summer reading program. We have used an online summer reading program for almost every summer that I have been at the library. The Massachusetts Library System (MLS) very kindly provides access to the program for all public libraries in the state, and I have absolutely loved using the online program. Kids log in to their accounts from either their home computers or the library computers, enter their reading time, write book reviews of books they have read, and then check in with the children’s librarians to find out what prizes they have earned. Easy for everyone, and I love that writing and comprehension skills are being maintained over the summer in addition to reading skills. The online program has always been fairly bare-bones, not flashy, just functional. This year is exciting, since the MLS has changed to a new program that has a game component to it. Each child has an avatar as part of their summer reading account, and as children enter their reading time, they earn points that they can spend to buy new body parts for their avatar. It’s really cool: current, accessible, and fun. In addition, this program has a challenges feature, in which I can set up various challenges that kids can choose to attempt. There are no points or prizes awarded for completing a challenge; it’s all about pride of achievement. I have set up book review challenges (write a book review), secret code challenges (visit the library and ask the children’s librarian for this week’s secret code), and scavenger hunt challenges (fifteen different challenges that encourage children to read different genres and types of books). I LOVE this new program, and I’ve been so excited to present it to the classes. The kids in the classes LOVE the new program, too, and are very excited to try it out. The surprise, for me, has been that in each class there has been at least one child who has asked me, “won’t kids cheat and lie about their reading time so that they can earn points to change their avatar?” Huh. It hadn’t occurred to me that this might be an issue – but once the first child asked me that question, I can see how it is a problem. If a child is more focused on the game aspect of summer reading than the reading aspect of summer reading, and if they want instant gratification when changing their avatar, then yes, they probably will cheat. Which is quite unfortunate. My reply to the “won’t kids cheat?” question has been to say that we use the honor system for summer reading, and that I know they are all honorable people. In addition, I say, there is pride in accomplishment in summer reading – if you earn a bookplate that goes in a library book, you want that bookplate to reflect your actual summer reading achievement. There is pride in that bookplate, and cheating won’t feel good. I hope my answer has been sufficient, and that the children participating in summer reading this year will continue to set reading goals for themselves and feel good about their summer reading accomplishments. Only time will tell if this is true, but I have hopes that it will be. I’m in the middle of my visits with the elementary school classes to promote the library’s summer reading program, and I’ve been thinking a lot (as usual for this time of year) about summer reading – what it is and why we do it. I love encouraging kids to read over the summer, since most of my happiest childhood memories involve books and reading. There’s nothing like losing yourself in a story when you’re a child; I haven’t been able to duplicate that experience as an adult reader. So I love that the library promotes reading over the summer, that we bring in fantastic new books for kids to discover and that we also have lots of programs over the summer, many of them literacy-based, to bring children into the library. But the prizes thing has always bothered me – always. Yes, I understand that offering prizes for reading can often get children who aren’t readers to discover the joy of reading through the back door method of offering them a toy in exchange for time spent reading. This is especially true for the youngest readers, parents tell me. But parents also often tell me that once the prizes go home, they go into a pile and are never looked at or played with again. Back in my first summer at the library (this is my eleventh summer), I changed the fundamental structure of the summer reading program prize awarding system. The system I inherited involved earning a wooden nickel for every fifteen minutes of reading (the nickels could then be “spent” on prizes which had money values attached to them). Cheating was rampant, since kids wanted the “expensive” prizes, which required more nickels. My first move was to eliminate the wooden nickels; my second move was to limit the total number of prizes that a child could earn over the summer. I added a charity donation voting component to summer reading, so that for each hour a child reads, they earn one charity donation voting ticket. The more a child reads, the more impact they have on which charity receives the donation at the end of the summer. I also added a bookplate in a library book for all children who read at least thirty hours over the summer (I can’t claim credit for either the charity donation or the bookplate ideas – both came from other brilliant children’s librarians). When visiting with classes, I stress that I consider the bookplate to be the ultimate summer reading prize, since whenever someone checks out the library book with your bookplate in it, they get to see how much reading you did over that summer – it’s a real point of pride, and many kids set and achieve high reading goals for their bookplates (some as high as 200 hours over a summer). But the prizes remain, and over the years they have gotten a bit out of control. My initial order of prizes was manageable, and looked attractive and appealing on display. Over the course of many years, though, the prize display has gotten obscenely large as I’ve had to order new prizes to replenish the supply. We have kept the prizes in their original display boxes, so that each prize is displayed separately. Some display boxes only have a few prizes left in them, some are newly ordered and fuller. This means that we have what looks like a candy store of prizes – boxes and boxes of prizes lined up on top of the shelves. The prizes have taken over the room, simply because I’ve kept them individually displayed. So this year is going to be different. I found plastic boxes that match the colors I long-ago assigned to the prizes (yellow, blue, and red), and each of those plastic boxes is going to contain an assortment of types of prizes. Kids will get to dig through the colored plastic boxes and select a prize from the assortment. And I didn’t order any new prizes this year, partly because I had to spend money on the plastic boxes, and partly because we truly have plenty of prizes on hand – it’s just that we only have a handful of some types of prizes. In my next post, I’ll address the troubling issue that has come up as I’ve met with the elementary school classes: the issue of cheating. And then I hope to have one more post on the topic of reading logs and how they can be both a blessing and a curse (inspired by this recent article in The Atlantic). 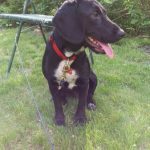 I might need to change the description of this blog – adding “and dogs” – because we brought home a new family member on Saturday. Her name is Clarabelle, and she’s a sweet, mostly mellow, loving gal from East Tennessee. 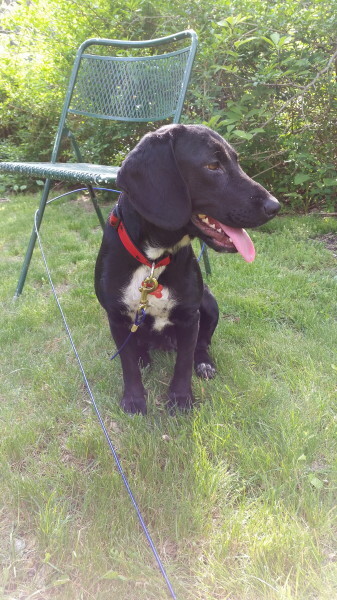 She met our vet yesterday, and he thinks she is less than two years old, and that she is a “failed hunting dog” due to her docked tail and her probable breed mix (he thinks lab/hound mix, or perhaps lab/hound/terrier mix). His best guess is that she was dumped after failing her hunting dog training. All we know of her background is that she was found near the end of April at a general store in Tennessee, where she was going into and out of the store being social with people. She then moved on to a different general store and did the same thing, at which point she was picked up by the MARC rescue group. Clara had obviously been nursing puppies, and the rescue thought that maybe the seven puppies they had found a few days prior to finding Clara might be hers, but she rejected those puppies. Clara was fostered in a loving home, and put up for adoption by Great Dog Rescue of New England (her name at that time was Layla, but we couldn’t live with that song going through our heads for the rest of our lives!). Clara is incredibly sweet, and good with people and dogs (a bit submissive with other dogs, actually). She rarely barks, although she gets a bit riled by bunnies in yards and the Weimaraner down the street. Thankfully, she couldn’t care less about our neighbor’s two barky hounds. We’re taking the introductions with the cats very very slowly, especially since Clara seems to have a bit of a prey drive (contrary to what the rescue group told us). So far Clara and the cats have only met by smelling each other’s traces in our living space and by seeing each other through the French doors. Our vet gave me some good tips to help ease the introduction process, including taking it very slowly, rubbing a towel on the cats and putting that towel in Clara’s crate, and good advice on how to manage the day of face-to-face intros. Clara has lived with a cat before, so we’re hopeful that we can make this work and have a very happy home! It’s hard to know where to begin when writing about my dad – it feels as though anything I write won’t do justice to him. So here are some memories of him that, to me, embody what a great dad and awesome guy he was. Dad loved to grow lettuce. He also loved to grow crookneck squash, sugar snap peas, and Kentucky wonder beans (and he’d always let the beans grow really big, so that the seeds were kind of mealy, which was just the way he liked them best). But he was most proud of his lettuce, and rightfully so. He’d come in to the kitchen with a big proud grin on his face, a dripping head of fresh lettuce in hand, wet from being hosed off outside. Unfortunately, Dad wasn’t so great at hosing off the lettuce, and it was usually still pretty dirty and gritty, and Mom would kind of roll her eyes in the face of the filthy lettuce and his happy smile and send him back out to wash it better. One of my favorite memories of Dad, which I think really shows what a great dad he was, is a day when he and I were out in his garden in the far back yard. I loved to tag along and watch him while he gardened, and I was probably only about 7 or 8 years old in this memory. Somehow, this day we managed to stir up an in-ground nest of yellow jackets, and the yellow jackets came swarming out en masse. Dad very calmly told me to run to the house as fast as I could, and I did, thinking that he would be running right behind me. But when I got to the house I saw that Dad had stayed out back with the yellow jackets, taking a ton of nasty stings so that I could get back to the house unscathed. After Jim and I got married, I would have weekly pancake lunches with Dad. I’d make the pancakes, and we’d sit and talk for a couple of hours about everything under the sun: politics, religion, good books, classes he was taking, and, of course, technology (I always told Dad that he was a techno-junkie, since he was always reading up on and often buying some great new technology item). I really, really miss those pancake lunches with Dad, and it’s going to be hard for me to make pancakes without feeling kinda sad. I was so happy that the staff at Robbins Brook made him pancakes on a regular basis. Dad was an absolute inspiration to me in how he always pursued learning – he was always taking classes and developing new interests and reading deeply about those interests. His intellectual curiosity was contagious. He was also amazing in his dedication to physical fitness, doggedly working out on his exercise bike twice a day and taking walks through his 90th birthday. Only his heart bypass surgery slowed him down, and even then he got back into his walks around Westvale Meadow as soon as he was able. His last real walk was with me on November 11, 2014, when we walked down the dike at Great Meadows. Though his body was starting to fail him, and though his mind was starting to be a bit foggy, he was determined to walk as far as possible down the dike. We only got half-way, but it was a beautiful day and one of my last best memories of Dad. I’m thankful that Jim, with great prescience, instructed me to take lots of photos that day. My memories of Dad over the last several months aren’t quite so happy; his last months were tough for me to watch and experience. But up until the end he sustained a deep passion for life, an intense will to live. And, perhaps even more importantly, Dad was an incredibly genial, sweet, appreciative, and wonderful guy up until the end of his life. I was so touched to see how many members of the Robbins Brook staff came to see him in his last few days, tenderly brushing his hair from his forehead and telling him how much they cared about him. I will always miss my dad: his wisdom, his caring, his passion for learning, his sense of humor. But as I sat on a rock by the Brant Point Lighthouse Monday morning watching the Nantucket ferry arrive with Dad on board, I felt very sad but also comforted. Dad’s last ferry ride was to a place that he loved, and I know that Dad is at peace now, after having lived a long and very good life. Yes, I have been very neglectful of my blog for the last year and a couple of months – life has simply been too busy, and I have been wrapped up in doing very important things. But I wanted to post a quick update to say that I’m still here, still a children’s librarian (ten year anniversary at my job was in November! ), and that I will write a more substantive post when life circumstances allow. And meanwhile I am working hard at bringing some new things to my library, things that I’ll be enthusiastic to write about in the future! And the nine year anniversary of my arrival at the library has come (and gone) – happy anniversary to me! A great way to celebrate this anniversary: the addition of a fantastic new program to the library calendar. Book Buddies began last Wednesday, and is my most favorite library program ever. Teen volunteers in grades 7 and up are paired with a younger buddy in grades 1 to 4 for shared reading and word games. Last week, the inaugural week, everyone was having such a good time that I had to gently remind them that the one hour session had ended…five minutes ago. The looks of complete surprise at a whole hour having passed already were testament to the fun that both big and little buddies had reading and playing together. My greatest thanks to Jennifer for finding this awesome program. In September, I said to her that we needed something new, could she see what she could find…and she came back with documentation and guidelines from other libraries that had already run successful Book Buddies programs. Jennifer pointed out that this is exactly the kind of program that we need to be running, and she was so very right. And one other new thing that we have added: a library Tumblr page. I really like Tumblr for the library’s purposes – it’s much cleaner than Facebook, and you have more control over how your posts look (including fonts and such). I won’t be replacing my personal blog page with Tumblr, but it has the right combo of hipness and accessibility for the purposes of the children’s room. Here’s the link, if you’d like to take a look.